RIM 950, RIM 957 "Blackberry"
Incredible Easy Wireless Email. Queues email up when out of range and automatically sends/receives when back in range. VERY nice for airplane folks. Thumbs up! The Blackberry 950 is a very cool device. It looks like a fat little pager with a keyboard and screen, and it fits comfortably in any pocket. It uses standard "AA" batteries and they seem to last around month with heavy use. You hold it with both hands and type with both thumbs. This method of input works surprisingly well. The device is also smart enough to turn abbreviations like "il" into "I'll"' which saves a lot of typing. This "autotext" list is customizable. Setup of the device was easy, although I had to leave a computer on back home with the Blackberry Redirector software running all the time. When email shows up in Outlook it's sent automatically to the device. When I send email from the device it looks like I'm sending it from work. This means I continue to use my existing work email address, which was quite "schweet" as my friends say. There is also an enterprise-wide email solution that your IT dept would run, freeing up your computer. Once the software we installed, email started to flow into the device. If I moved out of range, like in an airplane or a building's basement garage, the device's wireless icon dims. Back home, on my computer, emails are queuing up. When I got back in range the device started receiving those emails. Very nice. There is a "thumb-wheel" or "jog-dial" just the right side of the screen. This wheel controls the cursor, if you will. You can roll up and down through piles of email (I've got hundreds on the device) as well as move in all four directions while editing text. Pressing straight down on the wheel selects from the popdown menus. The interface is very friendly considering the small screen size. You have your choice of small or large fonts, and you can fit 8 lines of text on the screen using small fonts. The feature I find most compelling about this device was that is receives and sends email without me explicitly telling it to. Email simple shows up. When I write an email, I know that it will be sent. If not now, when the plane lands. The coverage was excellent. It works in most all major metropolitan areas, including all the cities I visited. I had no problem in Airports, cabs, or in any downtown areas. I literally didn't think about it's coverage area, which is an important feature of any wireless device. While this device is primarily an email machine, it can receive web content with add-on programs like Wolfetech's PocketGenie, and GoAmerica's Go.Net. For this smaller device, I selected PocketGenie. It's $9.95 montly fee gets you unlimited access to all the PocketGenie services. If you don't want to pay, some services like basic news headlines are offered free. PocketGenie offers news, movie times, sports, driving directions, stock info, and a lot more. There are no graphics, because of the small screen, but the content is very compelling. There are a few interface quirks, but it was very helpful finding a restaurant in Detroit, and movie times in Manhattan. It's not the web, but it's 95% of what you'd typically need. Because the PocketGenie software is a service that runs on top of the existing Blackberry network, it's coverage area is the same. The Blackberry 950 also syncs with Outlook into it's internal calendar, address, memo, and todo applications. It uses software from Intellisync, includes a cradle and belt clip, and works much like a Pilot in this respect. As a proud Visor owner and PalmPilot lover I hate to admit how much I love this device. It's fast, simple, and powerful and it allowed me to get my email and stay connected with out thinking. I used it on my trip more than any of the other devices. BUT - It’s just not my Pilot. As much as I like it, it's yet another device with batteries, buttons, and a screen that I have to carry around. Once my Visor is a pager, a cell phone, and wireless email I will finally be free. One device, one love. Until that day, I'll carry the Blackberry 950 too. Same as 950, but Palm V sized rather than Pager-sized. Larger. Excellent screen, higher resolution than a PalmPilot and VERY easy to read. Thumbs up! The Blackberry 957 is a thinner, larger device, a lot like a Palm V. It feels very sturdy, and is very cool device. It fits in a pocket, but since it's Palm-Sized, I felt weird using both it and a Pilot. The device supports includes a calendar, todo, address book, and memo, as well as add-on applications (the Go.Web Browser is an example of one) but there isn't the vast library of software than the Palm Platform enjoys. You also hold this device with both hands and type with both thumbs. All the same features and benefits of the 950, but with an amazing screen. The 957 is a souped-up 950 so Network coverage was identical. The GoAmerica Go.Web browser for the 957 is a very compelling application. The interface is very well thought out, and makes very good use of the jog wheel philosophy. While browsing, each link can be "wheeled" to and navigated to by a press of the wheel. This affords the user one-handed web browsing. Images take a while to come down, and the VisorCentral web page looked a little wrong, but their tailored content makes very good use of the screen size. Most web pages look better on the 957 than on a Palm Device. Any of the simpler text-versions of popular sites looked fabulous. If being truly wireless and email is your primary focus, I'd recommend this device over a Pilot. This device is easily compared to the PalmV/Minstrel Wireless Modem combo. 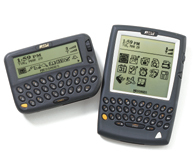 Personally, I dig the Palm solution, but make no mistake, the BlackBerry 957 is a slick professional device, and with the GoAmerica content added on is a complete Email/Web wireless solution with great coverage. If Palms, styli, and graffiti is not your style and you want a Palm-sized device with a keyboard, albeit a small one, the Blackberry 957 is for you. GoAmerica has also announced content for the Visor and the upcoming Visor Wireless Springboards. You'll find reviews on that springboard, and GoAmerica's services the nanosecond I get my hands on one, right here at VisorCentral.